Fatty acid testing is a valuable tool that can detect fatty acid imbalance and prevent or correct serious health problems. Recent research has indicated that Omega 6 fatty acids can be deficient as well as omega 3 fatty acids, and both are essential to maintain physical and mental health. Our cell membranes are a sliver of fatty acid, which encases and protects the internal components of each of our 1 trillion plus cells. Ruptures to this ultra thin membrane cause instant cell death. The structural integrity of our cell membranes are critical to things like gene expression, DNA function and even prevention of cancer. The proper ratio of omega 6 fatty acids to omega 3 is essential for the membrane to function properly. The proper balance of fatty acids is necessary to provide the cell membrane with both the rigidity and the fluidity to properly carry out the many functions critical to our physical and mental health. Patricia Kane is one of the world’s foremost experts on fats and health. Her groundbreaking research has alerted us to the fact that omega 3 fatty acids can be overdone, resulting in a fatty acid imbalance where we are not getting enough omega 6 fatty acids. Dr. Kane explains that while omega 6 fatty acids have been made out to be “bad fats,” they are in fact essential to the integrity of our cell membranes and thus to our overall health. They have gotten a bad rap, a misconception that needs to be corrected. Arachadonic acid, part of the omega 6 family has been associated with inflammation. Media focus on the inflammatory role of arachadonic acid has led to the misconception that all omega 6 fatty acids are inflammatory and thus to be curtailed. In fact arachadonic acid is a critical component in fatty acid metabolism. The recent popularity of fish oil , which is increasingly being recommended by nutritionists and holistically minded physicians, has led to a dramatic increase in consumption of omega 3 fatty acids. Dr. Kane has found that the proper ratio of omega 6 to omega 3 fatty acids is: 4 to 1. That is 4 times the amount of omega 6 fatty acids to omega 3 fatty acids. This allows the cell membrane to retain its structural integrity and normal function. This test is destined to become one of the standard diagnostic tools to detect possible fatty acid imbalance of omega 3 to omega 6 fatty acids. It is a very complex and sensitive test and there are not many facilities at present with the technical resources to do it. The premier testing facility for fatty acid testing is Johns Hopkins Kennedy Krieger Institute's Peroxisomal Diseases Laboratory. However, your antiaging physician should be able to locate a lab that is able to provide the analysis for this test. 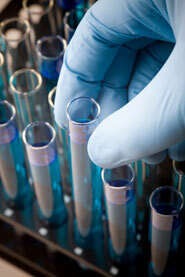 The test requires a fasting blood sample taken at a clinic or doctor’s office. The sample is then sent to the laboratory where it is analyzed using gas chromatography-mass spectrometry, with the aid of a computer. A report details the amount of each fatty acid as a percentage of the total fatty acid content of the red blood cell membrane. RBC(red blood cell) fatty acid testing is the only sure way to identify fatty acid imbalance. The Bodybio Company founded by Patricia Kane can provide the individual with personalized dietary and nutritional supplement guidelines that will help restore the proper balance of fatty acids.